Grow your own bait, or just compost your food scraps to make plant food! 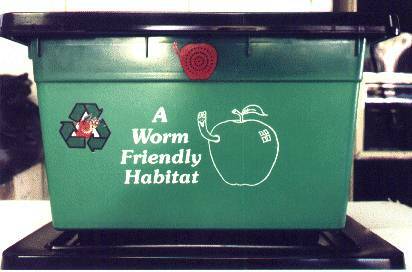 The Vermicomposting Bin is constructed from 50% recycled HDPE (High Density Polyethylene) and is available in green. The bin comes with four legs that are bolted on the bin with nylon bolts and nuts. Legs are 1.25" tall which gives you ample space between the tray and the bin for air flow. The lid comes with four air vents. This bin was designed primarily for the school kids so they could teach mom and dad about Vermicomposting. Other uses have been for growing live foods as advocated by the late Dr. Anne Wigmore for apartment dwellers and cold weather areas. This worm bin needs a minimum of 1lb Europeans to start up. $85.90 for bin, and 1lb European Night Crawlers.? Free Shipping Via USPS Priority Mail! !